Sometimes I work late. I know the rest of you do too, Edmonton. You’re among the hardest working peeps in Canada. But I also know how much you hard-workers love arts and culture. Hell, Edmonton’s a bastion of theatre, music and visual art. If you never experience an arts-based event in Edmonton, you probably don’t live here. Or else you’re a reclusive hermit. And hey, that’s cool too. But that hard-work and love for the arts isn’t always compatible. You work late, you eat late, and it’s hard to get out to an event at all without sacrificing something. Thank the gods for the people at the Winspear, then. 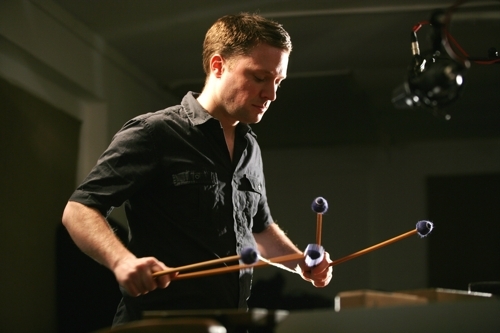 This Friday, they’re putting on a late-night percussion concert featuring percussionist Colin Currie. The show starts at 9:30, so schlubs like you and I can make it there. “We recognize that many people (especially the under-40 crowd) are not simply looking for a cultural and/or artistic experience when attending an arts event – the social aspect is also very important,” explains Phil Paschke, new media specialist with the Winspear Centre and Edmonton Symphony Orchestra. The event also includes live jazz in the lobby following the concert, something Paschke says is done to keep the relaxed atmosphere going and encourage patrons to hang around afterwards and socialize over drinks. This event had me wondering about how many young people really attend Winspear events that aren’t more mainstream concerts. “Our ‘core’ patrons skew older, as with pretty much any arts organization, and we’re going to nurture that audience as best we can. We wouldn’t be here without that audience, frankly,” Paschke says. With this in mind, Paschke says the Winspear and ESO are always looking for ways to connect with and be relevant in the minds of young Edmontonians. “We’re focusing on our social media presence, both directly through our own Facebook pages and Twitter accounts, but also indirectly, by developing relationships with other influencers,” he says. Regardless of the long view for the Winspear and getting younger patrons, I’m just glad they’ve created a concert event I can actually attend.